I think I have a plan on how to go about with my car situation. 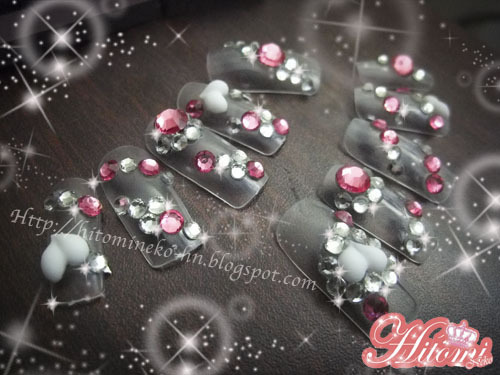 So I was more relax and was able to make these deco nails! So what do you think? Do you like it? I will make more of them & I can custom made them with your desire design and size! they are beautiful! Are the hearts hand made :O ?? i´m back! haha, wow, the design is so cute n_n! I love them!!! So pretty! I just wish that I could get rid of my nails biting habit first. AWhhh..
Those are so cute! I love the bling! Very fun for a night out or to perform a show. I like to be blinged out when I do a concert, I would wear them as part of my onstage ensemble. 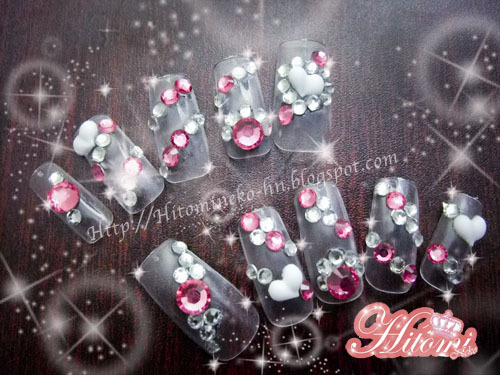 Can you make those designs on stick-on/self-stick nails? BTW, thanks for following my blog! I'm stoked!